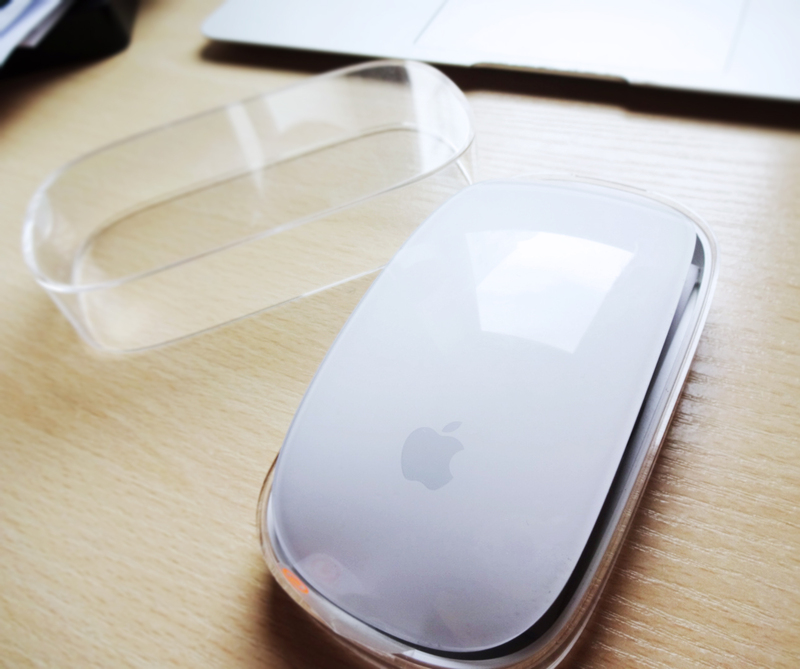 Apple’s Magic Mouse comes in a small transparent plastic box and the packaging is very basic, just like other products from Apple. With the mouse, the manuals and the warranty come inside the box. 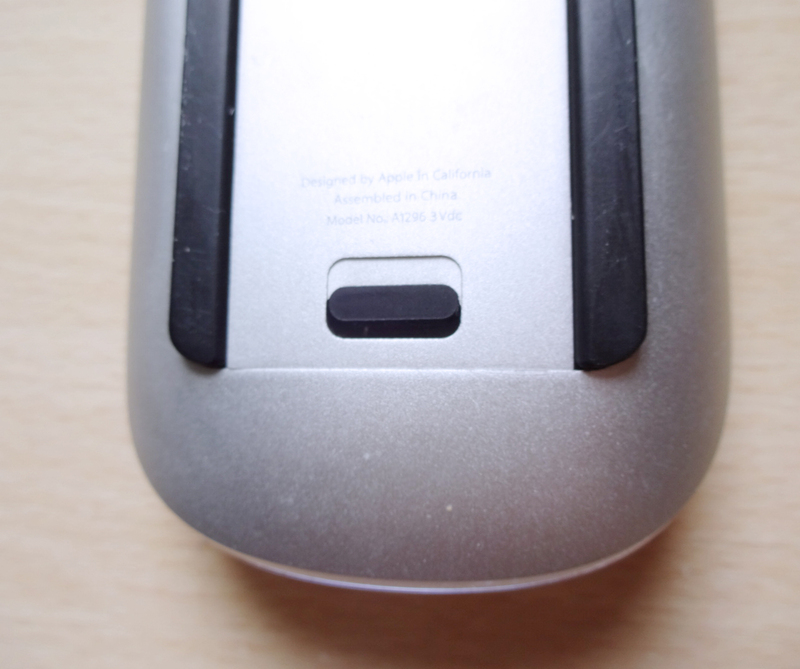 The bottom of the mouse looks like this. 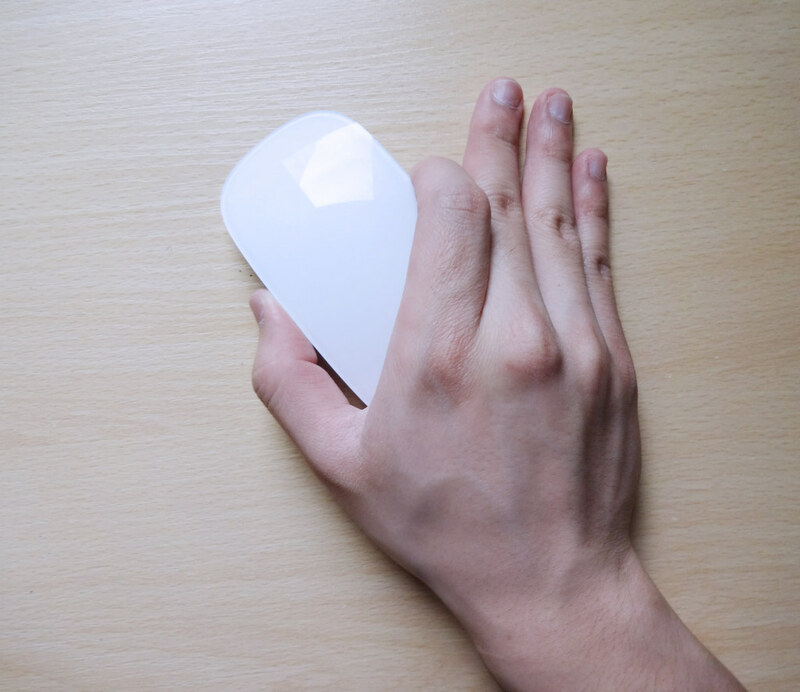 This is a wireless mouse. It uses Bluetooth to connect to the computers and this is really convenient because there are “no strings attached”. 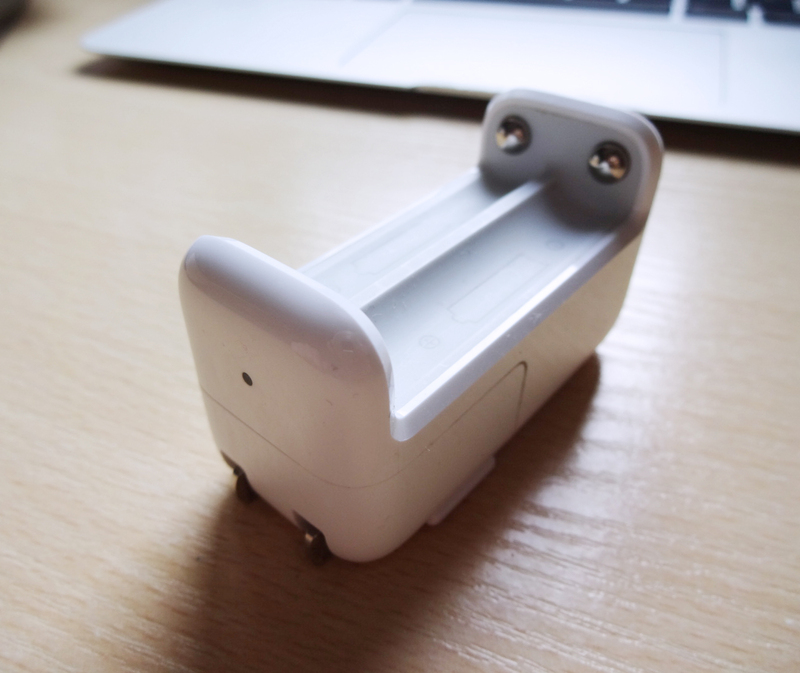 This gives some freedom and it is a USB port that you can save to use other things. To switch on the mouse, you just have to push the button up and both the lower part of the button and a small light on the top right corner will turn green. From this moment on, you can find the mouse in your computer, as long as the Bluetooth is on too. 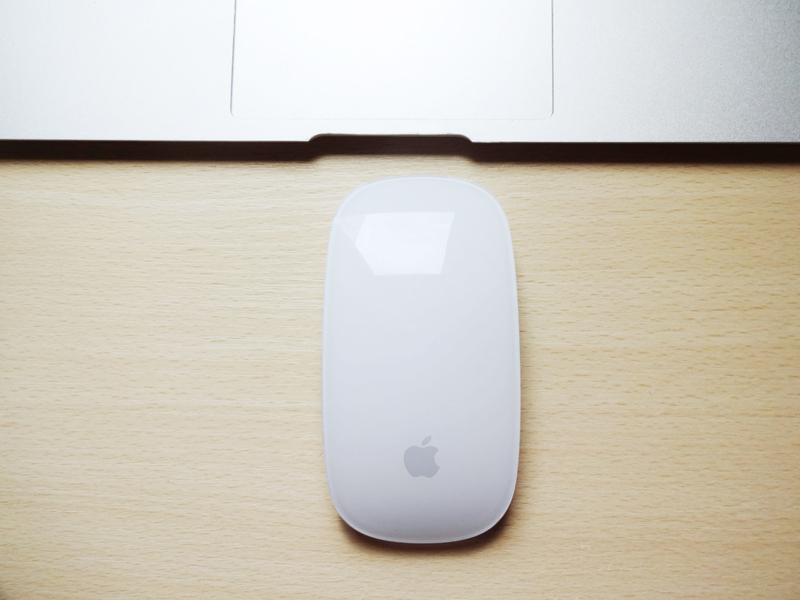 To connect them, it is as easy as clicking on the mouse’s name with the trackpad, whenever it shows up in the screen. In the lower part, there is another button, that will take the cap off and unveil the batteries. It comes with two rechargeable AA batteries, from Apple. The downside is that you’ll need to get an extra battery recharger, as the mouse doesn’t have a place to plug a cable or anything like that. 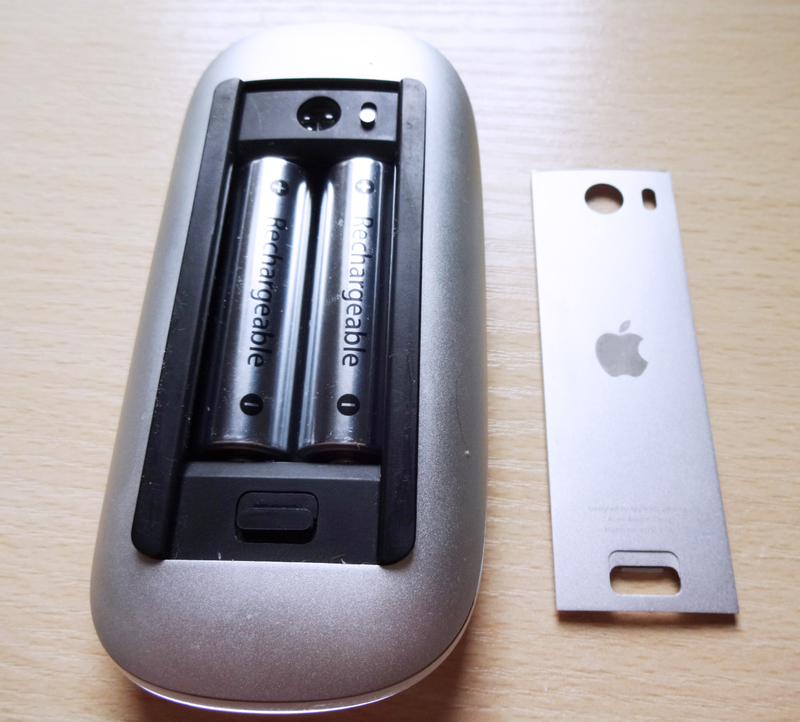 Apple supplies one for £25, and it is provided another 3 more pairs of rechargeable batteries along with the recharger. One of the aspects I am more pleased about this mouse, or the batteries, is that its battery life is really good. They take about 4 hours to recharge and it is possible to use the mouse for the whole day for about 3 weeks to a month. This is truly remarkable, because there are some other mice that require recharging every other day. 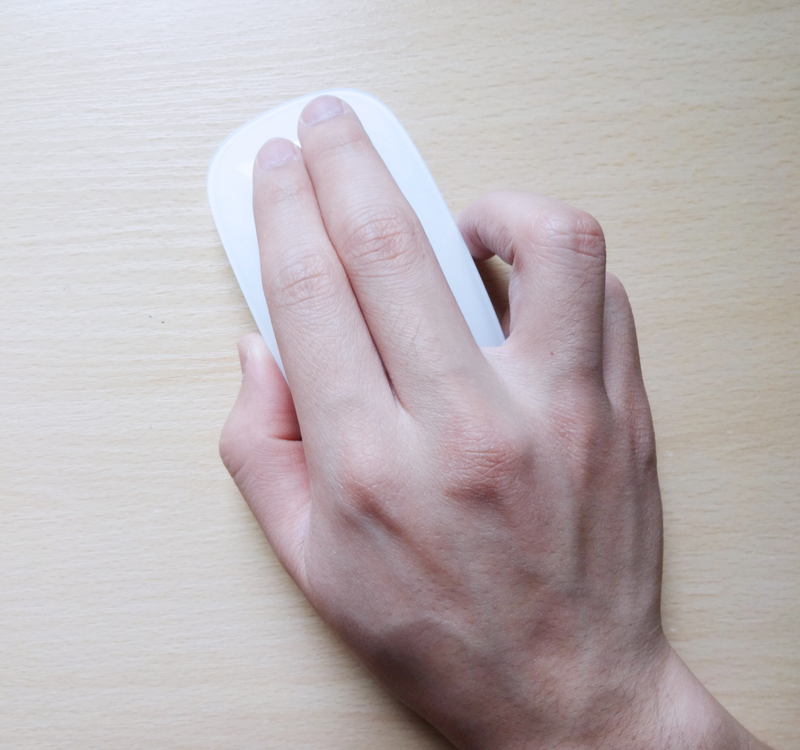 The mouse fits perfectly my hand, it is neither too large or too small. 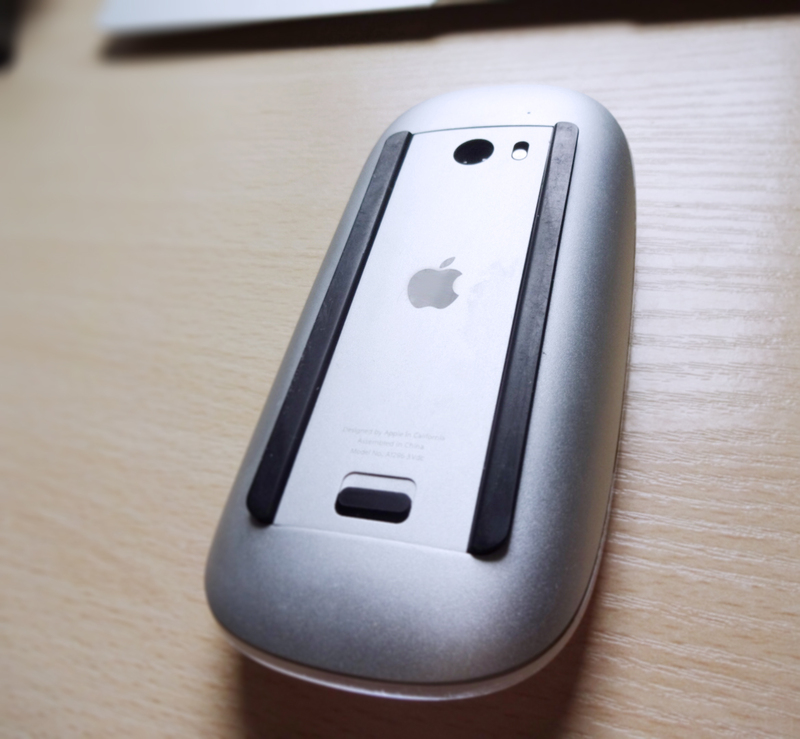 The simplistic design makes the mouse look like it doesn’t have any buttons, but the truth is that the mouse itself is already the button. The glass top is touch sensitive and it feels whether your finger is clicking the left or the right side. If you are left handed, you can change the settings and set the secondary click as the left side. There is not a scrolling wheel, but this isn’t a problem. Since it is touch sensitive, you can put one finger on the glass anywhere you want and scroll to wherever you want, from up to down, left to right. 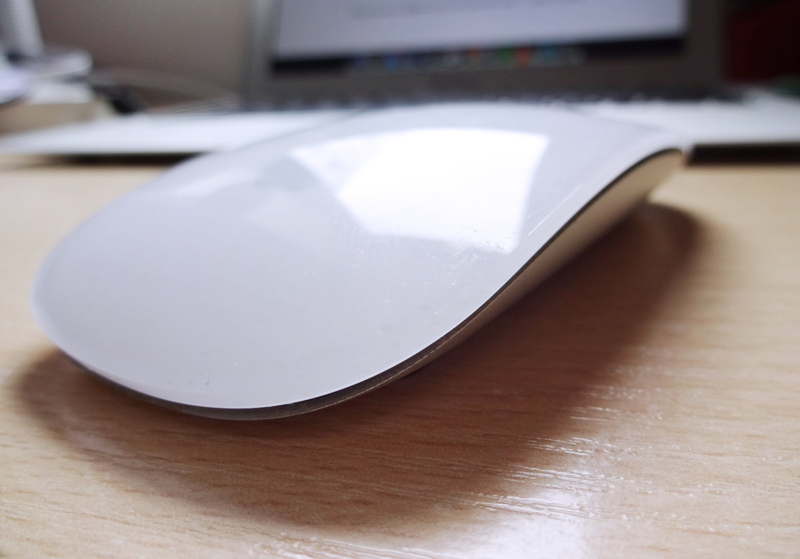 It is actually a very comfortable feature, while compared to the scrolling wheel. With two fingers you can swap between screens or go forward and backward in pages, whichever one you choose. By tapping twice in the centre of the mouse with two fingers you can go to Mission Control, where you can see all the applications that are opened and select the one you want to go to. This is the most useful feature for me, as with most mice I wouldn’t be able to do it as easily and would have to use the trackpad or the keyboard, every time I wanted to go to Mission Control. All the gestures I have described are the ones I use, but they are customisable to some extent. In my case, I feel the mouse is very useful. Most of the times, when I take the laptop with me to work somewhere else that not home, I forget the mouse and always feel something is missing. 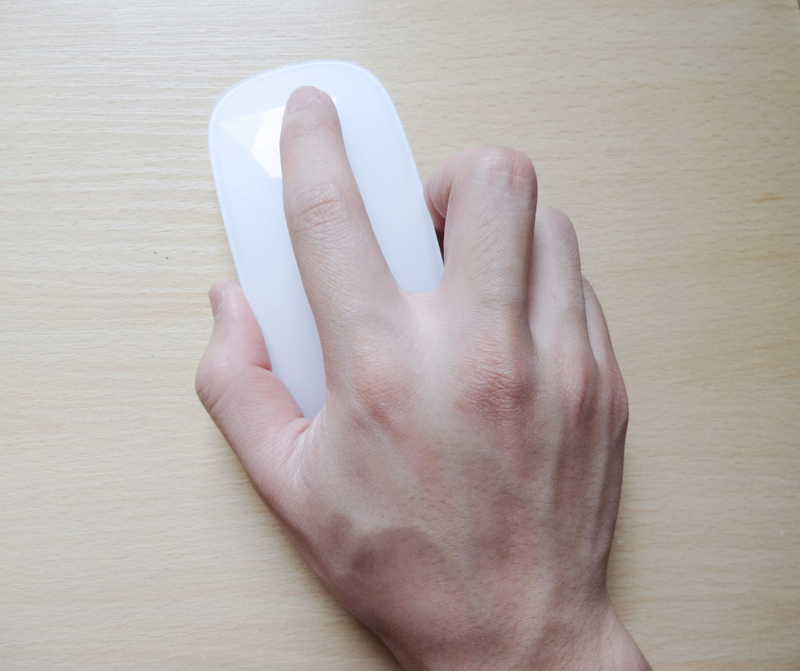 It does help me work faster and, as lazy as this sounds, I don’t need to extend my whole arm to reach the trackpad, and I can do tasks that only require the mouse effortless. However I can do that with any mice in general, is there a difference that would justify its price tag? Well, it’s hard to tell. I think there are plenty of other products that have one feature or another, but not all of them. Other mice can have the Mission Control feature, which, again, is the most useful for me, if they have a button that is intended to be customised to whatever you want and you can set it to the “F3” key. To be honest, I haven’t really seen any mouse that can scroll left and right. This is very useful when pdf documents are zoomed in and you want to go through them, or in Photoshop, when editing pictures. Finally, the battery life is very good too, so I feel that it nails pretty much all the fields. At the end it is entirely up to you, any mouse can do most of the things this one does, it’s just that the latter has some subtle features. But then again, aren’t the details that differentiate the “OK” from the “awesome”? This entry was tagged Apple, Batteries, Gadgets, iMac, Lifestyle, Macbook, Macbook Air, MacBook Pro, Magic Mouse, Mouse, Multi-gesture, Review, Technology, Touch, Utility. Bookmark the permalink. I’ve always thought I was a little strange because I use a mouse with my laptop. Glad to know I’m not alone 😀 I just can’t get the hand of the touchpad, and without my mouse, my productivity (or lack thereof) becomes an obstacle. 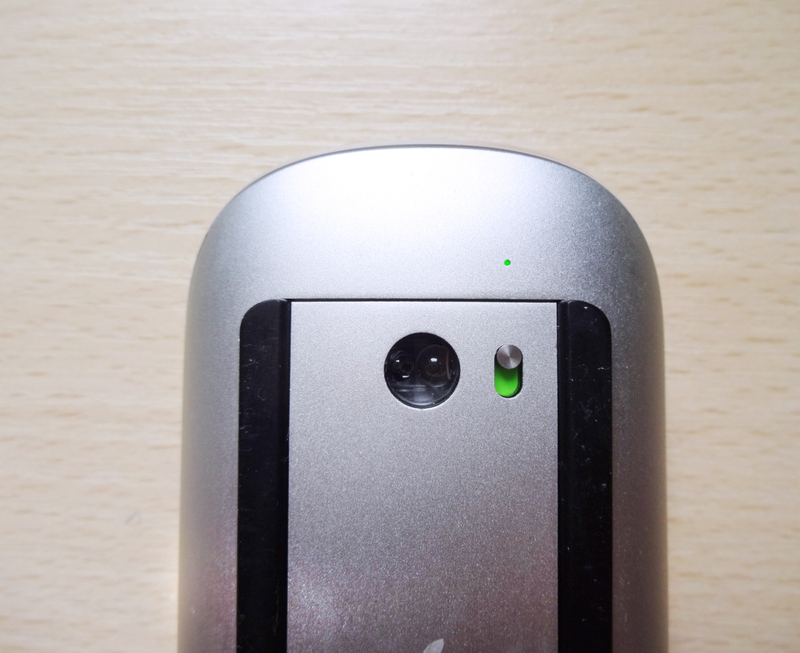 As for me, I’m a PC user and found a few years ago a great wireless mouse by Logitech that can be used on any surface. Seriously. I can roll it on a tabletop, on the arm of my chair, or even the leg of my trousers in a pinch – without it, I’m definitely lost! 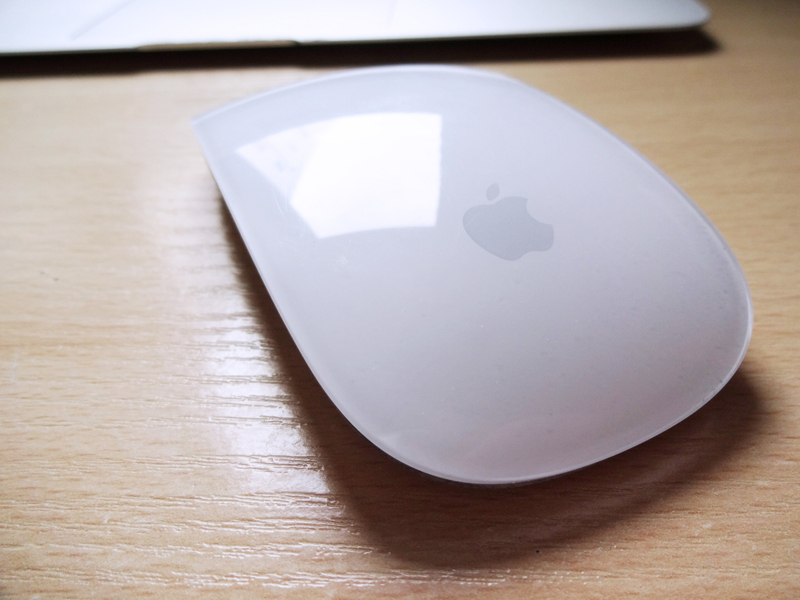 I actually only started using this mouse when I tried it, because at the beginning I felt the trackpad was fine. But any task I can do on the laptop was indeed boosted by the mouse. And now that you talk about that, I actually tried with this one and it works on my jeans too! I haven’t realised that before, thank you! You really did! I know now that I can trust my jeans if I don’t have a handy surface to use the mouse on! Thank you! I am completely unable to use a touchpad: I can’t control it. Not that I’m a Mac person, anywa … BUT ! – I have sent this on to my dear friend, who is; and I hope it persuades her. Thanks heaps ! I can use it, but I feel everything is done a lot slower, after I first used the mouse. I think this mouse works with Windows as well, but it wouldn’t be possible to use all its functionalities. Thank you for sending the post to your friend, I am very glad you think she’ll find it useful! Indeed it does! Once, they called me within 1 second, after I submitted my number in one of their forms to seek for help. Literally! Great explanation. It’s good to know what options are available. Thank you! I am glad you found it useful in some way. I am hoping that you love “using it”… Or did you eat it? Very instructive and also illustrative. I have been using a wireless mouse for quite a while now but it foes need a USB port. It uses normal batteries which last for almost a year. Not sure what is the advantage to be gained by this new mouse therefore. Well, everything has advantages and disadvantages. 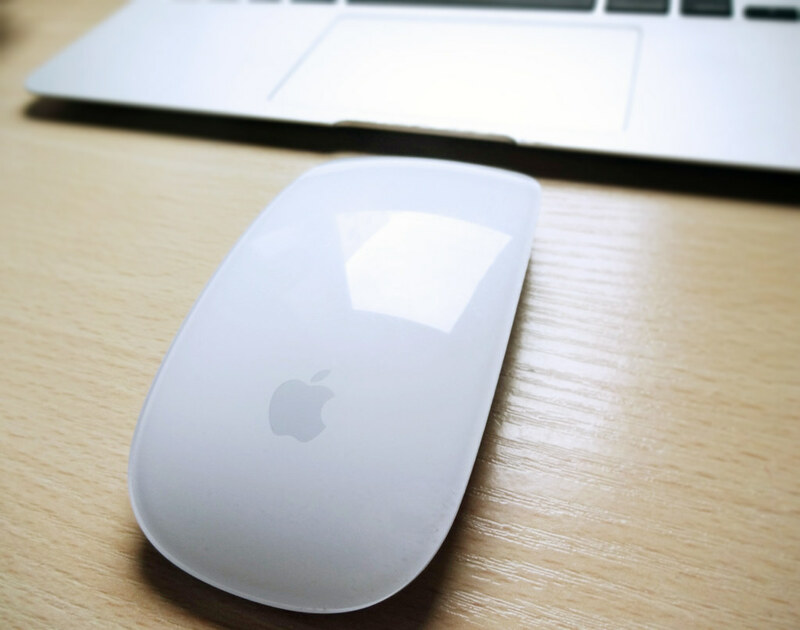 While the battery of this one doesn’t last as long as yours, it doesn’t need a USB port (if your computer has Bluetooth) and you can access some Mac OS features like switching between screens or access the Mission Control very easily. It really depends on the needs. I hope it helped in some way! the usefulness of this mouse remains to be seen. however, the information you provided is totally helpful! Thank you for the kind words. I am glad you found the post useful in some way. Thank you for stopping by!